Even at professional level, it is very obvious that some are climbers and others are not, so don’t get your chamois in a twist. Just get over it. Literally. Picture it in your mind. A Dub carrying a Kerry jersey for nearly 50km. There is no lovelier sight anywhere in the sporting world. It may come close to Jose Mourinho (or Gearóid) wearing an Arsenal tie, or Enda Kenny wearing an Easter lily. But it gets much better. 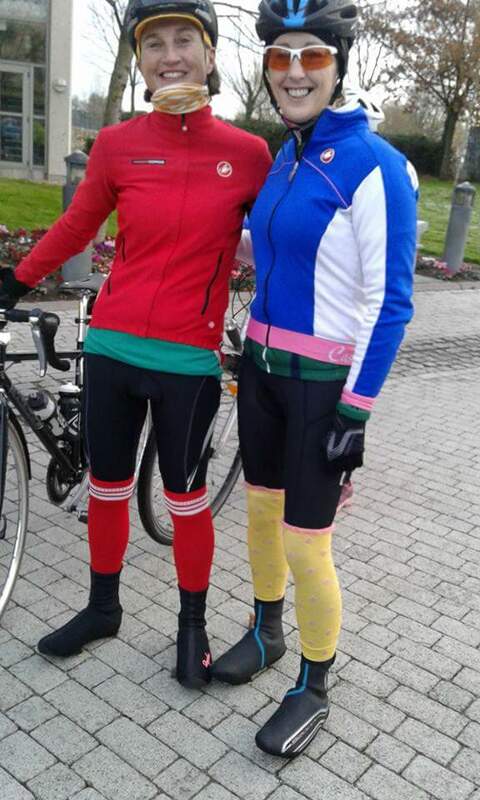 It gets better because the context is a Sunday morning club spin with Dungarvan Cycling Club. There was a white-Christmasy feel last Sunday, even though it was still November. Our recently reformed Group 4 headed towards Ballinroad in freezing temperatures, only to discover that the sunny south-east reappeared, together with mild air and ice-less roads once they crossed the river Deelish at Barnawee Bridge. Meanwhile, the menfolk stayed single-minded. This brings me neatly to the bike tip for this week. Who am I trying to be better than? Will anyone think less of me if I am not first to the top? Will others in the group still share coffee with me long after the hill is over? As Group 4 approached Griffin’s Garage the ladies requested a disrobing break. There were no objections to this. A DCC jersey was doffed and packed into a back pocket, followed by Karen’s Kerry kit (just the jersey, alas). Dubliner Declan zoomed into gentlemanly mode by offering to carry the jersey on his super-duper back carrier. This must have been a very difficult dilemma, gracefully offered. What happened next will blow your mind! (I got that line from FB posts about stupid stuff, in an attempt to get an uninterested user to watch crappy videos). As we all know, Waterford senior football champions, The Nire, were due to play a Munster final against Kerry’s Dr. Crokes in Mallow later that afternoon. Not surprisingly, our noble Nire native, Tony, intended travelling. All well and good, and most of us wished them well. However, the daring Declan proceeded to cycle in front of Tony for much of the remainder of the spin (bit of bloggers licence here…. it was only sometimes), and the sight of the Kerry jersey was like a green and gold rag to a bull. Line-dancing after coffee. It has that effect! Being a fair-minded reporter, Keith wisely omitted the episode from the local papers. Here’s his summary, and we thank him for it. In reality, I almost wish I’d been with Group 3 last Sunday. They had none of this Kerry / Dublin silliness. Rather, the cyclists’ Christmas wish-lists were discussed, agreed, composed and emailed using 3G data roaming along the N25 home from Port Láirge. Just for a moment, imagine the complexity of this, all the while holding a straight line using safe group skills. I really do begin to wonder why on earth anyone in their right mind would want to cycle with Dungarvan Cycling Club! New eyewear? Whatever next? In contrast, I’m reminded of the ever-sensible Group 5. 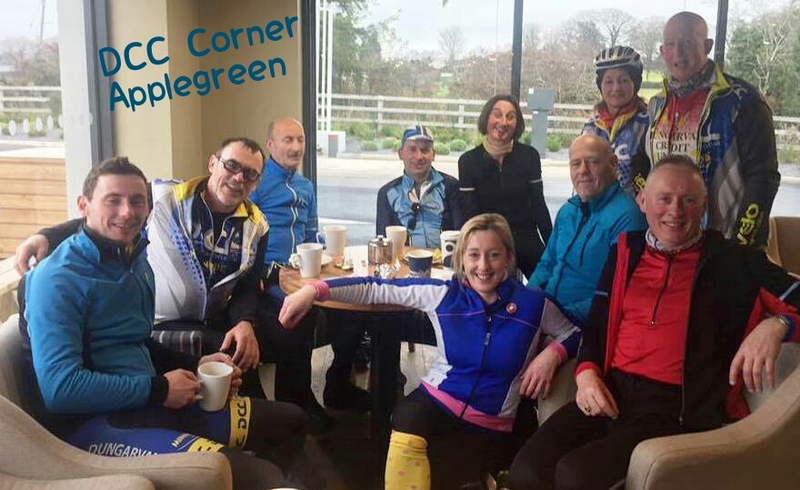 We met them for coffee at “DCC Corner” in Leamybrien. This group also has its ear-to-the-ground reporter, who leaves no wheel unturned to get at the truth. Thank you, Rachel. Dungarvan Cycling Club is based in County Waterford on the SE Irish coast and on the web at Dungarvan Cycling Club. Appendix 1: after they won the cup, they broke it! Appendix 2: Any offence taken by anyone to anything is unfortunate. The motivation has been unintentional. Don’t get your chamois in a twist. 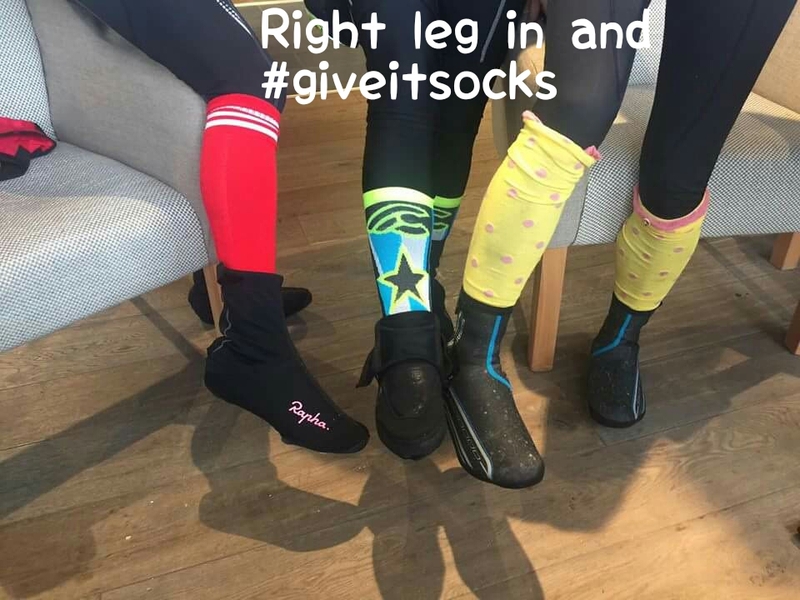 Finally, on a further non-cycling note I came across a wonderful tweet on Twitter (yep, that’s what happens there) during the week, but you’ll need to be sharper than a Nire forward! You lost your Irish mouse? Hard luch. U’ll have to come out with G1 or 2 some weekend, give a run down on the antics. Antics is good, but with g1/2 I’d need walkie-talkie with long range to be able to listen in, Damian! Previous Previous post: The Shoe Is On The Other Sock Now!